If we want the new system to succeed, we need to put at least as much emphasis on ease of adoption and return on effort as we do on the engineering. The most useful standard is the one most people adopt. Invariably, the successful standard is the one the combines good enough engineering with easy adoption and quicker return on effort/investment. The alternatives, no matter how much better engineered, invariably fall by the wayside or hang-on only in the more extreme fringes of the market. Our participation in this discussion shows we are not your average cardstock terrain customers. The quality we aim for and the work we're prepared to put in to realise that are almost certainly higher than most terrain customers. We need to recognize that fact and adjust our target accordingly. After all, it won't help much if we end up with the perfect system but the artists/creators focus their efforts on a lesser system that is far more popular. We have to be prepared to ease our standards for engineering this and make it easier/faster for people to see results on their tables. Lets face it, TLX is an awesome system and too many people are put off by how long it takes to start seeing useful results. You have to be a dedicated TLX builder to realise the true value of TLX - most cardstock terrain builders simply aren't that dedicated. Fortunately, there will be a sweet spot that gives most, if not all, of the benefits of TLX while also being easier and faster to build; a spot one where the engineering is good enough and the payback for new users is far higher. - That's where we need to be aiming. Back in the 1980s (well, some of us remember those days - lol), before the days of DVDs (and CDs) there were two competing video recording/playback systems: VHS tapes and Betamax tapes. They were similar, but had slightly different size (dimension) to their tapes cartridges. The upshot was that neither system could play the other's tape cartridge media. There was a battle between the two for dominance in gaining the greater market share of marketable movie titles; with numbers comes economic clout - and profit. It was argued that Betamax was the better engineered system. However, the VHS format won the Marketing War by gaining the lion's share of the available titles. Thus, Betamax fell by the wayside. It was only then that whole seasons of television shows started to become available along with the movie titles. Of course, it wasn't too many years until DVDs with their wholey different engineering design arrived on the scene, upping the ante beyond the reach of even VHS: allowing for more portable equipment (players), easier use, less wear and tear on the media (thereby extending their use life - oh! all those eaten tapes!) and far more cheaper to produce - not only the players themselves but the file carriers (the DVD discs) as well. LOL... I dunno if my experience is representative, but I think many people into things like cardstock crafts remember the 1980s even if my memories are more of laserdiscs, neon puffy jackets, and classmates kissing backstreet boys posters than they are of betamax. What I've got now is essentially similar to the TLX system - Converting down in simplicity is easy enough - Fat Dragon, for example, appears to not wrap the sides of their foamcore, and they use toothpicks to hold the tiles together. Which is an approach anyone can do with a TLX texture, or with one of mine. They're also using bobbypins or paperclips to hold corners of buildings together. I'm also pondering if corner-posts are even necessary if the walls are able to stand alone or have a way to slot into the base without the corner-posts being separate. If you are doing foamcore walls, ou could get all fancy-like and make rabbet cuts (with this) so they fit together perfectly. I did one building with foam walls with (manually) modified walls and it worked out decently. I bet someone versed in properly updating the digital components would make this look great. Add in your slot idea for the tiles and that would be amazing. Edit: Of course, what you gain in not making posts and anchors you may be reinvesting in cutting slots and tabs, but it might be worth a shot. Either way, you probably still need to tie the walls together somehow, especially if you are building more than one level. If you are doing foamcore walls, ou could get all fancy-like and make rabbet cuts (with this) so they fit together perfectly. Yeah, while that tool is neat, I don't want to require people to buy it. After attempting a fold pattern of a wall with the post included, it just became too complicated of a fold pattern. So I'm keeping the posts separate from the walls. Connecting the posts I'm going to have the template for 3 options, the TLX model, the Slit model, and what I'll call the Thin Dragon model. So-called because it's similar to what Fat Dragon Games' does, but with the posts being only the 5/16" posts, rather than the full 1" posts. Now to actually start working on the texture painting. 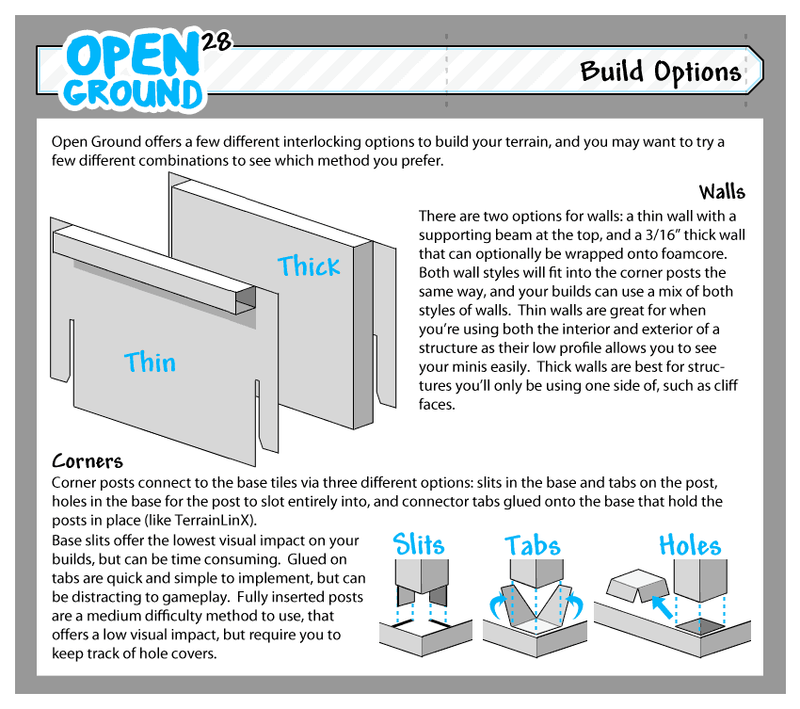 Personally, I'll probably use the holes style if I ever build anything, but the TLX style tabs are there too. I thinks folks with a robo cutter might like the slits style, since the cutter does the annoying part. Besides that, I'm working on painting a snowy stream texture that Erk asked for. Here's the build instructions for the basics: https://db.tt/96Ooz2hu If you've got any feedback, let me know. I'll also be working on an Artists guide in the next week or so. I'll probably also add standard sized doors and windows to the PSD templates for 28mm and 35mm figures. I've set my tumblr to allow users to submit previews of terrain they're working on with the Open Ground templates, and I'll happily share links to sell finished terrain. I'd like to build up a decent sized library of available textures before going into development on the marketplace website, so that'll be awhile before that launches. I've also got to figure out if the version of Illustrator I have is recent enough to create PDFs with layers that you can toggle visibility on and off, or if I'll have to spring for a copy of Acrobat. Or find another solution - my partner is suggesting something web-based that I don't understand the technicals on, but eventually the marketplace website could handle the pdf creation so artists won't need to own their own copy of acrobat or illustrator to also make layered pdf files. I like the layout. Nice clean design. There's a typo "compatability" - should be "compatibility". The section on "Protecting your work surface" is written in the first-person - "I recommend buying..." -- I think most of the document isn't written this way, and it stood out to me (if I were to put my copy editor hat on). I fear, though, that despite my longing for open 'standards', I'm still a debbie downer on this. Having spent some time experimenting, I still don't see the appeal of the old-style linx format. I think the slots on the tiles are as hard to cut out as before, but the connector pieces are even harder now to cut out. And, your advocating for yet another type of material. People are already confused about the concept of wrapping 3/16" foamcore with something that can accommodate 1/4" foamcore. Now, what thickness craft foam do I get? How squishy does it need to be? Is there a difference? It's the kind of questions that will stress out someone new to all this. I also fear that presenting three different ways to make walls, and three different ways to make posts stick to tiles, is just going to confuse new folks too. I have a hard time telling where my deep personal bias kicks in, but I'll freely admit I have a deep personal bias. I guess I'm OK with letting folks choose, but hopefully there is one The Way to do it that is the default always. I've seen the layered pdfs that most vendors make, and they are always lacking in quality. It's a pain to keep things straight, so layers will be mis-named, they will be in arbitrary order, or sometimes missing in some PDFs... they'll all be turned on accidentally and kill performance of the file... they'll provide combinations of layers that make absolutely no sense together and just slow down the process of making some pieces. I can get my brain around trying to have layers to support the different cutfile types. I can even get my brain around a couple graphic options, as long as they don't collide. Now to that I've got layer options for the style of posts, style of walls, corner types for tiles! Yikes. I'm just a little nervous about trying to manage all that. (or rather, I think I have the OCD to do it myself, but if history is a predictor at all, I'm afraid that the PDFs I buy from others will just get more complicated and less consistent). Looking at the picture, I still am not sure I get how the cardstock wraps around the tile a-la TLX, but allows you to insert/remove the hourglass shaped connectors. Seeing an actual tile in action would help. The pic on page 4 implies that the cardstock wraps around the bottom, but the pic on page 5 seems to show that there'll be no cardstock underneath. And, how well does this hold up with large, multi-level builds? How's the reception been in other forums and with other terrain developers? Do you have some pics of large-scale builds that you've done using all the different methods you're advocating? They'd be cool to see. Thanks for sharing this as you progress. I apologize if I sound too much like I'm all negative. I just want to share the negatives now, so you can think about it all and make informed decisions that you think are best, before unleashing stuff on the world. I also fear that presenting three different ways to make walls, and three different ways to make posts stick to tiles, is just going to confuse new folks too. I can understand your qualms about having the different build options, so I'll probably rearrange the instructions to go through just the simple sets first - the no wrap toothpick joiners with tabs. Then offer an advanced guide that elaborates on the other options. Basically, have a Beginner, Intermediate and Advanced build path. I'm not entirely sold on the idea of layerd pdfs yet, and the simple alternative is to have different PDFs. TLX already does with it's gridding and guides for the posts options - which I'd rather have a single, well organized pdf than 6 different pdfs for essentially the same thing. But this is something that for now, I'll leave up to the artists creating the textures to solve. As I said, there may be a better user experience solution available, but I still have some research to do. Looking at the picture, I still am not sure I get how the cardstock wraps around the tile a-la TLX, but allows you to insert/remove the hourglass shaped connectors. So for the TLX style wrap around, you use TLX tabs, not the hourglass shapes joiners. Obviously I need to make this more clear in the instructions. 1) Print out the Open Ground texture with "full wrap" - Don't cut it out. 3) Use the TLX texture as a guide to cut out the Open Ground texture. 4) Treat it as a TLX texture from that point forward. This assumes someone already owns and has built a TLX terrain kit. Since, from here forward, I'm going to expect a beginner to use toothpicks, an advanced user can opt for the craft-foam if they choose. For my own builds, I'm going to stick with it. You're free to use the TLX style tabs, but I'm not going to redistribute those out to people who don't already own TLX. Now, what thickness craft foam do I get? How squishy does it need to be? Is there a difference? It's the kind of questions that will stress out someone new to all this. I've listed that it should be 6mm craft-foam in both the instructions on the cut template. The Foamie's brand which is the most commonly found brand at Michael's and Jo-Ann's only comes in two thicknesses, 6mm and 2mm, and the 6mm is usually only available in white or black. I could list the specific brand to be more clear than just saying "craft-foam". I'm trying very hard to not just copy the TLX system, for copyright, AND for respecting Denny Unger as an artist. Yes, it would be extremely simple to just copy it, which is what it seems to me that you're implying, but that would mean selling anything that used that would be morally wrong, even if it manages to skirt the legality. I could also just sell the textures without any fold patterns whatsoever, but that'd only work for extremely advance level folks. Again, my goal is to create a template that everyone can use and sell without having to worry about the legal or moral implications of using something another artist has put their time into creating. Obviously this isn't going to be a solution for everyone, but nothing will be. I (and I am sure others) appreciate everyone's efforts on this. mproteau, I hear your concerns and I think some are vaild, however, from my perspective, the project AlisaTana is undertaking is not an entry-level product anyways. I see end users being drawn to Open Ground after using sets from WWG, FDG, and other companies. Might there be newbies grabbing this? Sure, but I really think the majority will be people with terrain-crafting experience looking to expand their options. With that being said, I do not feel the system is that overwhelming or confusing. Some polishing up and it should be fine. I may be way off base on this perspective, so feel free to rebut me, but for myself and the people I build terrain with, it seems okay. @joydyhee - I disagree strongly with the idea that it's not an entry-level product, but AlisaTana has already raised some points to try to address that. So for anyone who still cares, I've rewritten the instructions to be more beginner focused, and expanded out the alternate build options to their own set of instructions. I've also created a video that walks through the photoshop files and some tips on use. I'm not going change the templates I've completed so far, but I may still create new templates for things like rooftops. I suggest following me on tumblr to keep up with changes, as I'm not very good at keeping forums updated.